Homer’s Iliad told the tale of the Trojan war which was supposed to have occurred some 3,200 years ago. According to the tale, Troy was notably better than its opposition in every way, especially in the area of fortification. Nevertheless, the Greeks, through some ingenuity, sacked the Trojans and the rest is mythology. Whether the Trojan war actually occurred at this point is probably irrelevant, however, what can be gleaned from Homer’s writing may still be significant today. 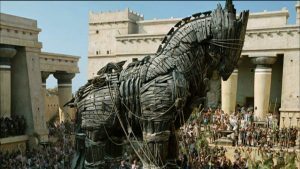 Most believe Troy was defeated because of the creativity and resourcefulness of the Greeks to fashion a wooden horse to conceal its best warriors, however, this was not the root cause of their downfall. The Trojans hid no impropriety. There was no inner conflict. The ruler of Troy was depicted as an exceptional leader. Troy was by all accounts one of the most exemplary civilizations to ever exist. So, what was Troy’s Achilles’ heel? Why did Troy bring the tribute inside their gates? Because they believed themselves to be worthy. Troy should have set the horse ablaze on the beach where it stood, but that would not have made for a compelling third act to the story. Like the Trojan Horse, sin does not manifest itself within the gates of our heart. It presents itself before our eyes and ears enticing us to think ourselves deserving of such delight and honor without detecting its barbed inescapable hook. It would have been no small effort moving a very large wooden structure filled with soldiers and their weapons from the sandy beach to a place within their gates but this is what people do when monuments are presented to them. Few are wise enough to recognize when a gift is given to glorify the giver at the expense of the recipient. Once accepted, even the smallest tokens can become indiscretions which could make way for destructive influences and nullify any defense. It is not too difficult to draw a parallel from the Trojan horse debacle to sin, but this perspective is individual. Homer’s Iliad posed a consequence to a corporate problem. To what circumstance could this lesson be applied collectively today? How would an enemy attempt to infiltrate a country in order to do it harm? Those against a U.S. border wall represent the Trojans who opened their gates. 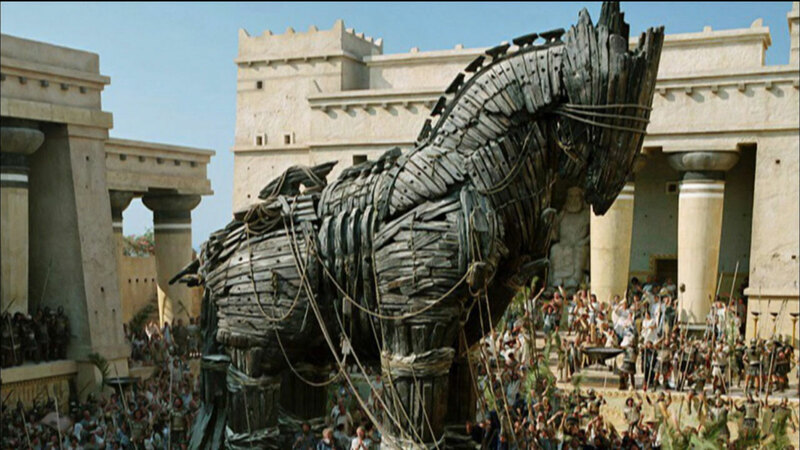 Those advocating open borders equate to the Trojans who ushered the giant horse inside the city’s walls. The massive number of unvetted immigrants are the Trojan horse. The terrorists are the refugees who gain access by playing the role of victims who are let in by other like-minded victims from within. These parallels should be enough to get us to think twice about opening our borders to every Tom, Dakhil and Jose. If a country continues to suffer attacks from emotionally, spiritually and intellectually impaired zealots, it will not be due to the enemy’s strength and resourcefulness but because of the nation’s shortsightedness and naivety. Acts 20:35 states, “It is more blessed to give than to receive,” in order to condone the benefit of work. The verb, to give, has no merit. It does not make someone special on either side of the equation. To give merely implies direction as to where something moved. What and how something is given is only marginally important compared to the purpose in which something changed hands. Actors win Oscars, Emmys and Tonys. Musicians win Grammys and Doves. We tend to believe these awards honor the recipient for their achievements when the real purpose is to promote the respective industry. What the star struck audience fails to see through the elaborate packaging is the glorification of the organization responsible for giving the award. John Wayne, Carry Grant, Bill Murray, Tom Cruise, Glenn Close, Johnny Depp, Harrison Ford and Annette Benning were all talented actors. They were all one-of-a-kind. They also never won Oscars. They did not need the “associated value” of an award to enhance their marketability. Former President Obama was awarded the Nobel Peace prize yet did no more for lasting peace than any other president. Every car manufacture promotes their products through awards which they themselves create. The greater the reputation of the award source the greater the honor of the award. Point being, the world has been conditioned to believe someone who wins is more valuable than someone who escapes recognition regardless of the award’s dubious honor. Those who envision a nation without the insulation of a border fall victim to the greater indiscretion. They do not fall prey as conservatives do by glorifying themselves through the acceptance of gifts they do not deserve. The left glorifies itself by playing the role of the giver: to be thought of as good, fair and honorable by others – as if the praise of men merited any real value at all. The Greeks fashioned and presented the monument at no small expense, but it is not called the Greek horse, and for good reason. The Trojan’s paid nothing, however, they put their name on it when they took possession. But the greater deception isn’t in receiving the “professional courtesy” or even giving a gift to glorify ourselves. The greater deception occurs when we presume we can manufacture honor and forgiveness and award them to ourselves. Like sin, putting our name on something may make us feel good, it will never contribute to us being good.